Today was a dreary, classic London day. The sky was gray and rain drizzled down, but it never poured. The rain was just enough to wet things up, but not enough to wash anything. In the light f such circumstances, I did what every good Londoner should do; I went to my favorite local pub, The Exmouth Arms, for fish and chips. I love the little pub just a block or so to the north of us. It’s constantly packed with a menagerie of characters, the music is loud but never overwhelming, and the food is spectacular. My go-to are their sliders (which I had as my first London dinner! ), but I’ve been eyeing their fish and chips for quite awhile. Today was the day, I decided. So I packed up my two bags (my backpack to study after lunch, and my gym bag to work off the fish and chips after studying) and headed over to The Exmouth Arms. The bartender greeted me warmly and I ordered my fish and chips, practically salivating with excitement. The fish and chips were advertised as being breaded in a batter made with a locally-brewed lager, Camden Hells Lager. After a short wait, the fish and chips emerged from the kitchen upstairs. The wait was totally worth it. The batter was crispy and superbly flavorful, and the chips were among the best I’ve had in London. They were thinly cut, closer to American fries than the traditional British steak-cut style I’ve seen most other places, and fried to a crisp. The peas were also extremely fresh, and I could have definitely eaten way more than the small cup provided. The whole collection was so good I could have eaten it without vinegar at all, but I did add some after the first half to provide a comparison to other fish and chips places. 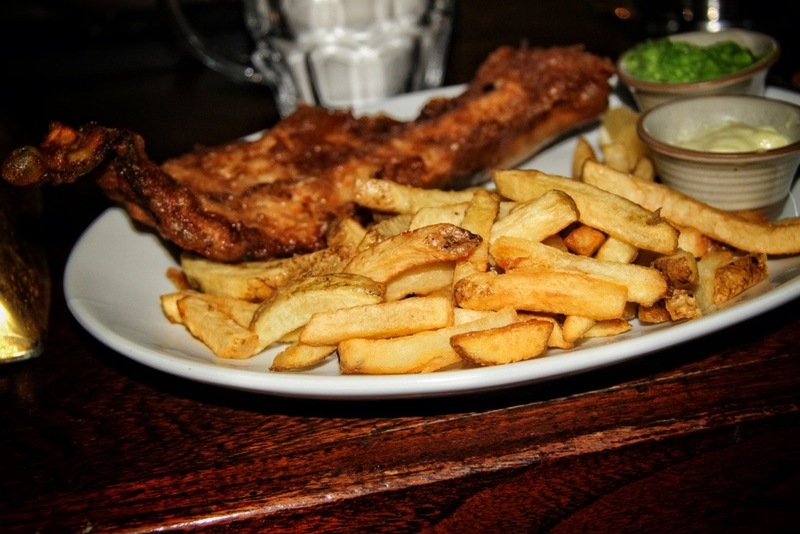 The Exmouth Arms emerges as another top contender for the best fish and chips in London. It’ll take more “research” to determine a winner, but I’m up to task!